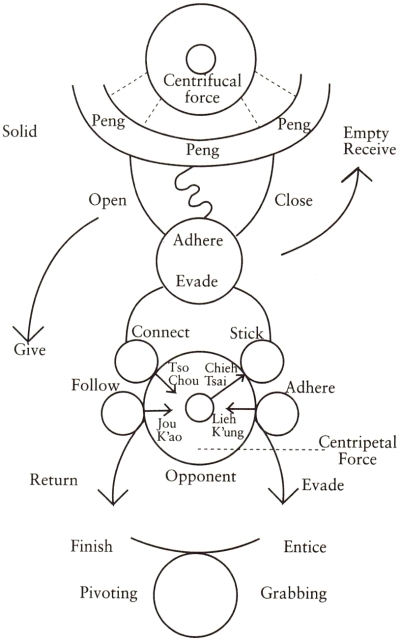 A diagram from Kuo Lien-Ying’s T’ai Chi Boxing Chronicle. The diagram connects several of taijiquan‘s significant energies, or jins, representing the nature of each jin with an expressive curve. For example, the serpentine curve between Open and Close represents Folding: “Folding transitions are connected without interruption. Folding is done with the hands, revolving is done with the legs. Folding brings the opponent’s movements to the extremity; thus you fold when you receive. It lengthens energy and is never intermittent or broken off. “If you intend to move upward, then first fold from below. If you intend to move to the left, then the folding must start from the right. This way the energies are mutually connected. Also, a firm grasp of this drawing of silk exists, so one never receives straight, directly, or rigidly. This contains the idea of the hands working together in accordance with the steps. Regardless of whether you enter forward or retreat backward, the steps must follow the turning of the body to the left or right. Never enter straight or retreat rigidly. The energy inside the legs is stable and sinks without being intermittent or broken off. Boxing chronicles say that the forward and returning motions must have folding; enter and retreat must have revolving” (p103). Four paintings from the Color as Field exhibition currently at the American Art Museum, with notes from the associated catalogue by Karen Wilkin. 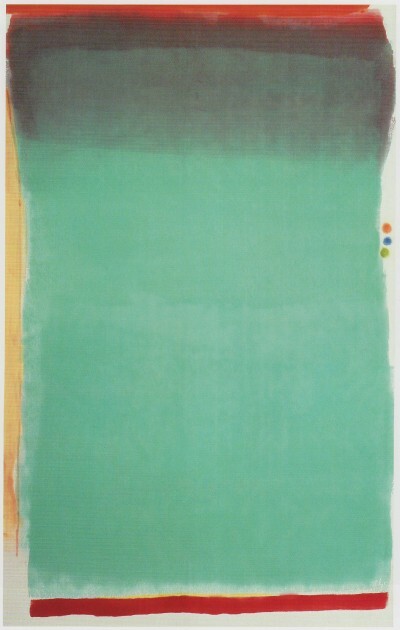 Jules Olitski, Tin Lizzie Green, 1964, plate 24. “While scrupulously avoiding anything resembling psychological symbolism, the ‘post-painterly’ conception of ‘cool’ included the belief that a painting, no matter how apparently restrained, could address the viewer’s whole being — emotions, intellect, and all — through the eye” (p17). Friedel Dzubas, Lotus, 1962, plate 32. “Discrete shapes, dynamic imbalances, cursive drawing, and even the most elliptical, implicit suggestions of narrative were all jettisoned, in various combinations and sometimes all at once. 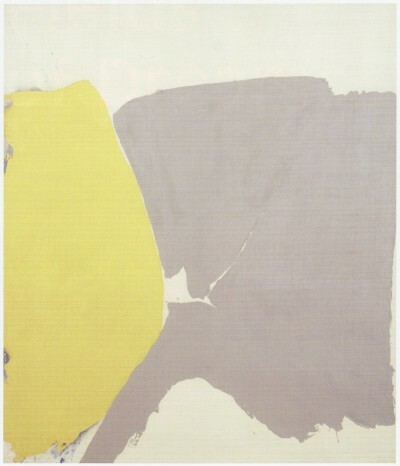 The single indispensable element proved to be color — in generous amounts — which, paradoxically, both emphasized the painting’s presence as an object and suggested vast, ambiguous spaces that one saw into but could not, even metaphorically, enter” (p17, 22). 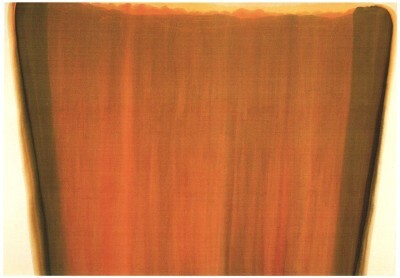 Morris Louis, Mem, 1959, plate 16. “This emphasis on color was usually allied with a strenuous avoidance of the materiality so crucial to gestural Abstract Expressionism. Touch could be so reduced that paint applications in Color Field abstractions can seem, depending on our sympathies, either inexplicably magical or almost mechanical. Color can appear to have been breathed onto the surface or, when thinned down and soaked into the canvas, to have fused with it, the way dye fuses with fabric. The results is an ineffable, seemingly weightless expanse. Even though essentially all we are left to contemplate are the physical materials of painting (refined as they are), the result is an exquisitely rarefied type of abstraction in which material means are almost completely subservient to the visual. Any lingering vestiges of the painting’s lost history as depiction disappear, and we are faced with pure, eloquent, wordless seeing” (p22). 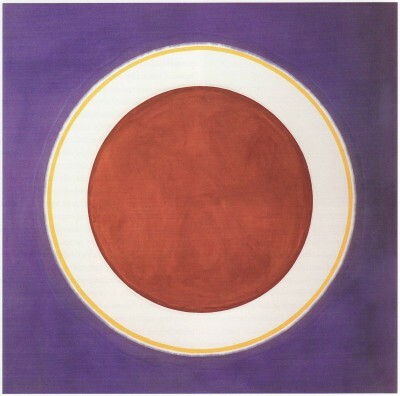 Kenneth Noland, Earthen Bound, 1960, plate 19.